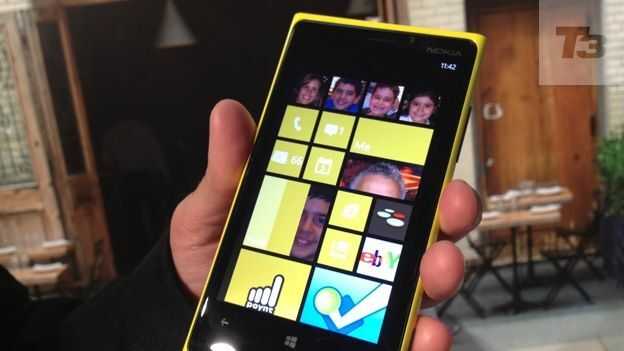 Will Windows Phone 8 be enough to make Microsoft a mobile phone success? Like the previous version, this is wholly different from the other systems on the market. It's unlike iOS 6 and Android, which are led by their apps and have a structure where you have to go back to the home screen to change between programs. Glance at a Windows Phone and you can see it's fronted by a ribbon of apps running down the display. These are called live tiles because they update information dynamically. Not just by adding a badge with a number on to tell you there are emails waiting. No, here you can find weather information, maybe details of the next flight you're going to take and so on. Incidentally, it's worth noting that Windows Phone 8 isn't backward-compatible to Windows Phone 7 handsets, like the Nokia Lumia 900 and HTC Titan. Those phones will have their own update to Windows Phone 7.8 in the coming weeks but for the new software a new handset is needed. This was already an appealing system and now it's become much more flexible. Tiles were previously either oblongs the full width of the screen or squares which fitted two side by side. Now, they can be resized as you like. Four can fit where one square tile was, for instance. This makes the screen pretty busy, but you can customise it as much and as often as you like. The small tiles can still display information but, for example, you don't get the fun animations on the Games app when it's at its smallest size. What's more, the tiles now fill the screen. Before, there was a gutter down the right side and an arrow to tell you where to find the apps list. Now, it's tiles everywhere. Another update, though not one you'll see directly on screen, are the chassis requirements. These are what determine screen resolutions, compatibility with multi-core processors and so on. These mean the hardware can be much more capable, with some early Windows Phone 8 handsets, like the Nokia Lumia 920 and HTC 8X having screens that are higher-resolution than the iPhone 5's Retina display. There are improvements to lots of core features on Windows Phone 8. The lock screen, for instance, now gives you a range of photos to see when you turn on and there is a wider range of apps which can provide notifications to the lock screen, too. For emails you can choose between black and white inboxes. The new black inbox has white text on a black background. If this sounds a rather petty upgrade, it pays dividends if you have an AMOLED screen which, unlike regular LCD displays, uses more power for brighter, ie whiter, screen images. Kids Corner is a new parental control feature which allows children to access the apps, music and video you've selected for them. They flick left from the lock screen rather than up. A password screen stops them from getting full access to your phone and if they try to unlock it, the phone won't automatically wipe its data after a series of wrong password inputs. Which is a relief. There's also Wallet, which is a place to find loyalty cards, boarding passes and more – a bit like Passbook on iPhone – and which will work with NFC as a payment option. But it has to wait for the credit card companies and other providers to catch up. Maps have been given greater usability by being downloadable in advance so you're not racking up data charges when abroad. Nokia has had this for years but is now sharing this and other features with non-Nokia Windows Phone 8 handsets. There are upgrades to the camera, including lenses to create special effects, while the web browser is now closer to the full-screen version of Internet Explorer. And journalists were cheered to find that screenshots were finally included in the OS. It's incredibly useful for us hacks to grab screens to show readers what an app looks like, say, but it's also useful for a wider audience. You can grab an image of a map or browser page so you don't lose it when you're out of network area, for instance. It's a welcome addition and neatly done (press power and the Start buttons at the same time). Skype is now integral to the user experience on the phone so making VOIP calls is as straightforward as regular ones, which is pretty cool. None of these improvements would be useful if the phone was sluggish or unresponsive as a result. However, the big bonus of software that only works on new hardware is that it means it's working on handsets specifically designed for it. We've tried Windows Phone 8 on a range of handsets and it is consistently slick and speedy. There's one area which is consistently an issue for everyone other than Apple and Android: apps. There are well over 100,000 apps now, but even now it's only just catching up with some of the most familiar and key apps found on other platforms. Windows Phone is still the most recent entirely new phone OS to launch (though BlackBerry has its software just around the corner). Two years on, it's still fresh and different, but now has so many improvements and additions it feels even more innovative. True, for anyone moving from iOS or Android there's still a bit of a learning curve, but once you get your head round Microsoft's different way of thinking, it's a highly appealing set-up. And the similarity to the new PC software Windows 8 means it'll become more familiar as Windows 8 is more widespread. It's attractive, reliable and fun to use.